News has been coming in that at least a dozen people have been killed in a mass killing at a Washington DC Navy Yard. Tonight we will check in on what we know. Last night, an Indian American was crowned as the new Miss America. Tonight we ask Deepa Iyer (South Asian Americans Leading Together) & Tanzila Ahmed why her coronation was so controversial. Plus, there have been one too many stories of an unarmed someone in Miami being killed by one of its many police officers. What can we do about it? Judy Greene (Justice Strategies) and Iris Roley think that the answer may come from Cincinnati, Ohio. Finally, Mass Transit in Miami is often considered an oxymoron. Find out how the folks from TRAC Miami hope to change that. Will the cop who killed Reefa be allowed to stand his ground too? even get his job back…as a Miami Beach Police Officer. originally from Colombia, Trayvon was born and raised in Miami. Reefa was 18 when he died, Trayvon was 17. Beach Police veteran Jorge Mercado. standing their ground even when they aren’t. that are tasked with upholding the law are failing at their jobs. as a thug and the cop who killed him as a hero. for the long fight for justice. Subscribe to our iTunes PODCASTS and never miss our show! The late Richard Aoki has been called many things:long time California-based community activist, victim of Japanese internment, former member of the original Black Panther Party. But one thing no one ever expected him to be called was an FBI informant. 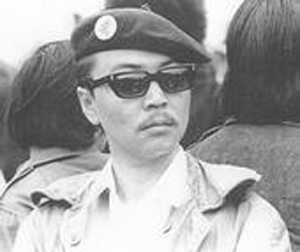 Investigative journalist and author Seth Rosenfeld released the proverbial cracken in his new book Subversives: The FBI’s War on Student Radicals and Reagan’s Rise to Power claiming that the now deceased but still respected Aoki was working with the FBI while he was a member of the Black Panther Party (and apparently the one that first supplied them with guns). In an exclusive segment, we will air our interview with Seth Rosenfeld and talk to long time community activist Bob Wing (former co-editor of Colorlines and War Times magazines) about the allegations, whether they are true and what it all means. Plus check the clips of the interview with Seth Rosenfeld you didn’t hear on the show. Plus check out the “Church Commission” report on the Black Panther Party. And look below for the Center for Investigative Reporting’s youtube clip. The Republican national convention is coming to Tampa and the world is watching how this swing state is going to respond: with open arms, closed fists or scratching heads. We will talk with friend of the show and head of Miami Young Republicans, Bradley Gerber (yes our show has Republican friends, deal with it) about what we can expect when the big elephant comes to the I-4 corridor. Ariel Marantes was all over the spanish-speaking press last week, but you wouldn’t know it if you watched “mainstream Miami press.” What was he is the news for, getting beaten senseless and kicked repeatedly by plain clothes officers of the Miami Dade police department. Hear his story, another exclusive.